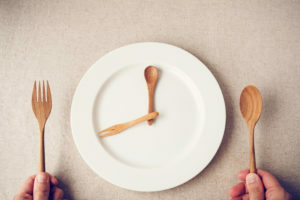 One of the hottest topics in the health and fitness space is intermittent fasting, a lifestyle choice wherein individuals choose to halt their intake of calories for specific periods of time. Many studies now show that the practice can not only drastically improve mind-body health, but can increase longevity, per Healthline, citing various evidence-based sources. As opposed to traditional diets, which create boundaries around what one can eat, intermittent fasting emphasizes the when. The most common methods include daily 16-hour fasts and an 8-hour window of eating, or fasting for a full 24-hours twice per week. Despite what we’ve been told about the importance of three meals a day, eating constantly may be further away from our nature than we think. Throughout evolution, humans have typically gone long periods without eating, and many of our health issues now come from a world where endless options are available to most of us at the touch of a button. More Americans struggle with obesity than ever, and the epidemic is spreading worldwide. Meanwhile, big food and beverage corporations and weight loss companies continue to have a hold over the media that we consume. Since there are very few products and services for purchase tied to fasting, many of us have only just heard about the topic through the web or word of mouth. It’s important to note that proper intermittent fasting means one does not overcompensate in the windows of eating to “make up for” the skipped meals, and therefore all of the methods typically result in weight loss due to lower calorie intake. The less obvious benefits of fasting include what it does to the body on a cellular and molecular level. For example, levels of growth hormone rise as much as 5-fold, aiding in fat loss and muscle gain. Insulin sensitivity improves, lowering blood sugar by 3% to 6%, and fasting insulin levels by as much as 31%. Additionally, studies show that fasting leads cells to initiate cellular repair processes, and increases the function of genes related to longevity and fighting off disease. Short-term fasting contributes to weight loss not only due to lower calorie intake, but also from the release of the fat-burning hormone norepinephrine. Studies show intermittent fasting can increase metabolic rate by 3.5% to 14%, and reduce harmful belly fat which can build up around organs and cause disease. Inflammation, a primary culprit of may chronic diseases, has also been shown to be reduced by short-term fasting. Various animal studies demonstrate that the practice can significantly prevent cancer. In studies involving rats, the animals who short-term fasted lived 36% to 83% longer. As for brain health, short-term fasting has been shown to increase levels of the brain hormone BDNF, and may aid the growth of new nerve cells, and protect against Alzheimer’s. Additionally, fasting has been shown to reduce bad LDL cholesterol, blood triglycerides, inflammatory markers, blood sugar and insulin resistance, which all contribute to heart disease. Other benefits of fasting include positive lifestyle changes, aiding to simplicity in routine and making meal prep and planning less time consuming, costly, and thus more manageable and easy to maintain. Those who are currently underweight, have a medical condition, or have a history of eating disorders should consult with a health professional before fasting. Ultimately, there is no one size fits all for a health and wellness regime, and individuals should continue to focus on quality sleep, healthy foods and exercising regularly. For those interested in trying out a new system with proven health benefits, and which also serves as a powerful weight loss tool, intermittent fasting may be a great option.